For the lazy man who can’t be bothered to buy a proper wattage lamp here’s the Clever Clapper, a Clapper that finally has the ability to dim the lights. 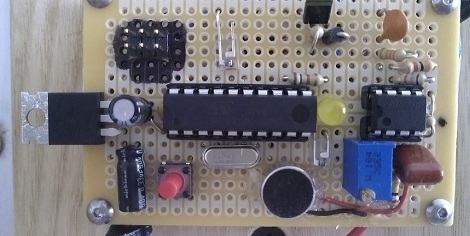 Like the clapper we saw last month, [Pete]’s version uses an ATtiny2313 and an electret mic. What sets [Pete]’s version apart from the vintage 80s model is the ability to dim the lights. Like any clapper, two hand claps within a second toggles the relay. Clapping three times within one second puts the lamp into fading mode. In this mode, the lights dim up and down with PWM until a fourth clap is detected. [Pete] saw that the program memory in his ATtiny2313 wasn’t 100% full, so he added a few more capabilities. If you shine a laser onto his circuit, a relay trips and turns on a decorative moon lamp. There’s also a ‘lecture mode’ that feeds the microphone directly into the microcontroller to vary the PWM signal. The result is a light that brightens with more intense sound. Check that feature out after the break after the demo video of [Pete]’s Clever Clapper. I followed it fully up until the word “sadly” after that it’s all a bit wtf! I like the old school way of including art work in a video, we saw in the first video. I like the lecture mode as an alternative way to building a light organ. Used explore to save Pete’s blog as a mht file. I wish Firefox has a similar way to say to save a web page as a single file. He is doing PWM with a relay? Sounds bit odd imho..
That is an excellent device. Very well made and very aesthetically pleasing. Thanks for posting! Why does the summary contain the word “relay” when the circuit it’s self does not even use one? It does use a relay. Follow pin 8 (T0/PD4) from the micro-controller; you’ll see it’s attached to a series resistor, and then a 2N3904, to switch the coil current of the relay. I kinda rolled my eyes after seeing so many dollar signs on the EAGLE schematic. It’s mostly an aesthetic thing, I know (but don’t even get me started on AdaFruit schematics…). Another item of concern: TIP120, which are Darlington-configured bipolar NPNs. Aren’t those a bit antiquated? I’d think using some good logic-level MOSFETs (or maybe even a MOSFET driver if you really wanna drive ’em hard) would be much better in terms of power dissipation and current handling capabilities. Note: I tried an XHTML tag in my message, so if it didn’t work, please don’t crucify me. can’t i use tip122 instead of tip 120?